Tennis footwork is the foundation for preparation on all tennis strokes and arguably the most important aspect of the game. The common theme with all top tennis professionals is that they have outstanding footwork. Many professional players utilize different grips, swing patterns, and styles of play, however, in order for the pros to execute their strokes they need to be able to move to the ball and set up their body properly. When a tennis player’s footwork needs improvement often times the player is set up too close or too far away from the ball. Another common habit amongst tennis players is that they let the ball play them with the ball being too high or too low, disrupting their balance. All of the items mentioned above increases the risk of making errors. Proper footwork allows players to set up and deliver their strokes as intended. Throughout the history of the sport, have come established ways of moving on the court for a wide range of scenarios. Just like in basketball or dance there are technically sound ways of moving, tennis is no different. There are certain ways to move out to the ball and there are certain ways to recover back for each scenario. The ready position is the stance that allows you to react effectively to the actions of your opponent. Just like a boxer has a ready position with his hands up to deliver offense and defense, a tennis player has a ready position that promotes effective movement on the tennis court and the stance is repeated constantly. It is important to learn the ready position so that your opponent is less likely to capitalize on flaws in your movement. There are specific elements that make up the tennis ready position. The ready position is an athletic stance, with your feet shoulder width or more apart, knees slightly bent, and body weight on the balls of your feet. This will lower your center of gravity and allow you to react explosively in any direction the ball takes you. The upper body is loose, with your hands holding the racquet out in front of your body. 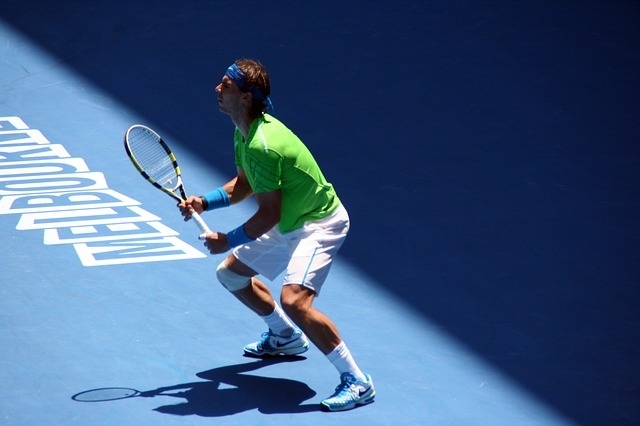 The racquet head is held slightly up with the shoulders in line over the hips. The head is level and the eyes are focusing on the ball or the opponent. Think about the upper body for the ready position being as if you were sitting in a chair with good posture. For the legs think about being around a foot shorter than your normal height so you can spring quickly to react to your opponents shots. What cues and clues have you experienced that have helped you identify the need to step up with better footwork? What is a Split Step? The split step is a small hop that you take from the ready position which allows your body to react explosively to the ball. In order to initiate the split step you want to time your split step by focusing your eyes on the ball and judging when your opponent’s racquet will make contact with the ball. Over a short period of time you should be able to pick up on your opponents stroke patters and time the split step effectively which will be covered shortly. Is the Split Step Exclusive to Tennis? The split step is seen in others sports such as soccer when the goalie hops slightly to get ready to react to the opponents shot. The split step only comes off the court by an inch to a few inches and is intended to load your legs with weight like a spring when landing. At landing your legs should be equally weighted and loaded so that you can push off explosively to react to your opponent’s shot. When Should I Split Step? The split step should be initiated prior to your opponent making contact with the ball on every stroke. Since the opponent can hit the ball in any direction, you need to be able to change direction and react in any direction effectively and the split step makes that possible. Timing the split step can be difficult especially if you are not use to doing it consistently. The goal of the split step is to set your feet on the ground and load your legs so that you can explosively react to your opponent’s shot as soon as you realize where the ball is headed. In my experience I have found that even if I think I know where the ball is headed when my opponent is making contact with the ball, video always shows that I am still in the air at contact which is the norm for all players. Overtime you will find that you get a feel for the split step and you do it habitually, but as with everything it takes a lot of repetitions to build the muscle memory. You only land the split step when you know where the ball is headed, not before that time. In what scenarios do you utilize the split step differently and have you seen the split step in other sports as well? Tennis footwork builds upon itself and particular section covering the first step reaction and adjustment steps is a continuation from the tennis split step. Once you complete your split step, you will have recognized where the ball is headed and begin moving toward the ball which. Let’s assume you are playing on a hard court and you are receiving a baseline groundstroke. First, pivot your feet in the direction you want to move, this will naturally load your weight on your outside leg and rotate your hips and shoulders. For the first step, push off your outside foot and begin moving to the ball. Think of the outside foot as being the loaded leg of a sprinter in the starting block, the first push off sets the tone. If the ball is hit to you, you can focus on making small adjustment steps to establish your spacing between you and the ball, which we will cover in the next section. Focus on the push off for your first two steps to the ball they are critical to great movement. Now that you have completed your split step, taken your first step reaction, and ran to the ball, it is critical you take the steps necessary to position yourself for your stroke. To ensure you are in the optimal place to set up for the ball, tennis players often utilize adjustment steps, small calculated steps. Adjustment steps can be forward, backward, horizontal, and diagonal movements. Without taking the adjustment steps you may find yourself too close or too far away from the ball, or taking the ball outside of your optimal contact zone. Some symptoms that may present you with an opportunity to practice your adjustment steps are when you notice your shoulders lifting up when you make contact with the ball, which is a symptom of being jammed, hoping up on strokes in an attempt to create space, and having your body weight headed in a direction other than what was intended after contacting the ball. Try it out! What are other ways you have found that help you set up to take your shots at the best height and optimal spacing? There is a Follow Through for Foot Work? In tennis there are strokes that require a follow through of the racquet and on certain strokes the back foot should follow through as well. When you hit open stance, often times your shoulders and hips are facing the net with your feet relatively parallel to the baseline. That is the ideal finish with the feet. When you hit with a neutral stance groundstroke, ideally the last step is forward into the court toward the net, which opens up your shoulders and hips. After your hips and shoulders have unloaded into the ball, it is important to allow your back foot to naturally follow through forward so that your feet are again parallel to the baseline. There will be times where you need to hit with a closed stance and your last step to the ball is a horizontal movement. This typically happens on the return of serve or a ball that forces you to take the horizontal step out of necessity due to being on the run or stretched out. This is not favorable because your hips have trouble unloading into the ball, however it happens and when it does focus on bringing your back foot all the way around so that your feet are once again parallel to the baseline. The reason for the back foot follow through is recovery. By doing the follow through you are able to recover back to the middle of the court sooner and therefore more effectively. A coach may ask a student to hold their back foot back on the closed stance groundstroke, which resembles a golfer’s finish on a drive. The coach may be testing the student to see if he or she can establish balance. Remember there are progressions to each stroke in tennis and it’s important to focus on only one or two things at a time. Now that you have completed your stroke and your feet are somewhat parallel to one another it is time to recover back to the center of the court. The most common way to recover back is the side step. The side step is performed by pushing off of your outside foot to step with your inside followed by bringing in your outside foot. When performing the side step your feet should not touch one another and your body posture should be similar to that of the ready position. The reason why tennis players choose to side step back to recover rather than run back is due to a few factors. First, due to your body posture, being similar to that of the ready position, it is easy to transition into the split step from the side step. The side step also allows you to change direction quickly, where as running back would make it easy for your opponent to hit behind you and capitalize on your inability to change direction effectively. Tennis players often utilize the cross step combined with the side step to recover back in certain scenarios. The cross step is commonly utilized when you are pulled off the court and need to cover more ground to adequately recover. After you have completed your stroke with your feet somewhat parallel in relation to the baseline you can initiate the cross step. The cross step is performed with the same body posture as the ready position and side step. First, you want to push off with your outside foot and step across your inside foot, while maintaining your posture and having the core of your body facing the net. After you take one cross step, it is important to transition into the side step. The cross step is great for when you need to cover a good amount of court quickly in order to recover. Ensure you only take one cross step prior to transitioning to the side step. With the legs crossing each other on the cross step, you must be able to split step prior to the opponent contacting the ball. 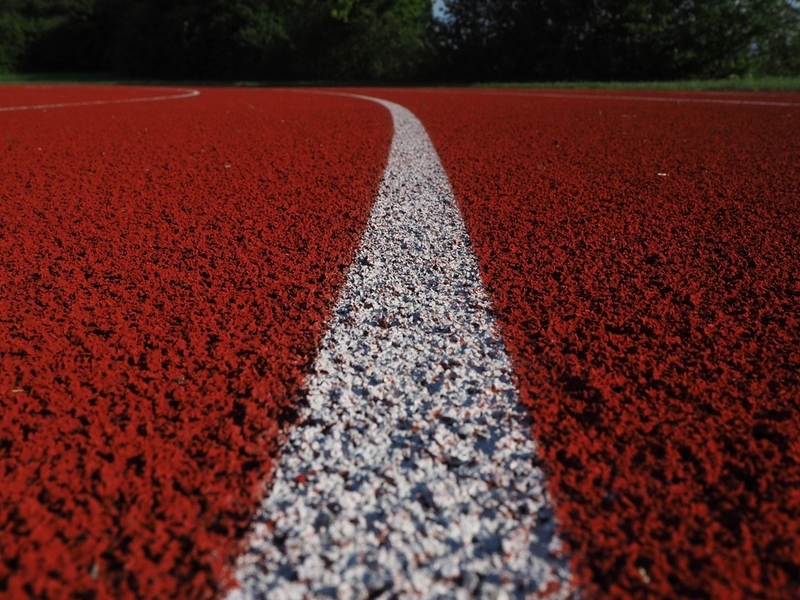 Taking more than one cross step would complicate your timing of the split step. Another option to recover back is the run step which is similar to the cross step and the first step reaction. The run step in initiated after you complete your stroke and you have your feet near parallel in relation to the baseline. Similar to the first step reaction, you want to pivot your feet in the direction you want to move, which will naturally turn your shoulders and hips perpendicular to the net. Next, push off your outside foot and take a run step. After one run step, make sure to transition back to the side step so that you can split step prior to your opponent making contact with the ball. This will give you the opportunity to be on balance and react quickly in any direction that you choose. There are some best practices that are worth highlighting that will complement your overall tennis footwork, especially when receiving balls that are not going to land in your optimal contact zone. When playing tennis you want to have happy feet at all times. Yes, I said Happy Feet. Happy feet can be described as staying light on your feet by constantly being on your toes and moving. This will allow you to time your split step and react quickly. Whereas standing flat-footed, having your weight on your heels will tend to slow down your reaction time and foot speed. Taking adjustment steps, small calculated steps, to ensure you are in the optimal spot to hit the ball is essential to setting up effectively and consistently. There is no restriction on how many steps you can take so make sure you take as many as necessary for your optimal set up. Don’t be afraid to vary your depth along the baseline. When the ball is going to land short or deep in the court, you want to move up or back diagonally to meet the ball at your optimal contact point. Often, tennis players will find themselves slotted along the base line, taking the ball at different heights, letting the ball play them. By moving diagonally up and back, taking adjustment steps as necessary, tennis players can simplify their set up by eliminating excess risk that is present on high or low balls outside the player’s comfort zone. There will be times when you won’t be able to move fast enough to meet the ball at your optimal contact height. When this occurs, the best tools at your disposal are your knees. It may sound simple, however players don’t often think of their knees as being utilized to adjust your contact height. This is important because by controlling your contact height you can have greater consistency with your body mechanics and swing patters being the same. When you find yourself bending at the waist to play a ball, ask yourself if you could have used your footwork and knee bend to play the ball with upright posture. What other movement in sports can you think of that is beneficial to move toward the Ball and be proactive? What comes to mind for me is a basketball player goes up for the rebound aggressively. Think how that go to mentality could benefit your game. Let me know your thoughts on the tennis footwork guide and come say hi to me on Facebook!